Teti is the new exclusive wall cladding system by Orsogril® made up of shaped metal profiles welded to 4 mm diameter vertical round bars. 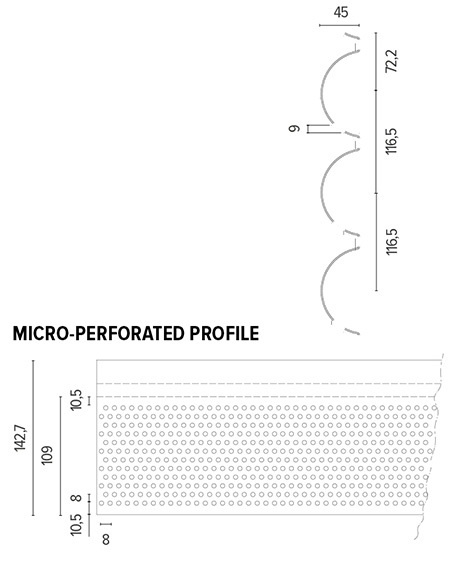 It is available with both solid and micro-perforated profile version, which enhances permeability and elegance. The unframed panel can be fixed directly to the structure. This characteristic makes the installation quick, cost effective and versatile for original projects. 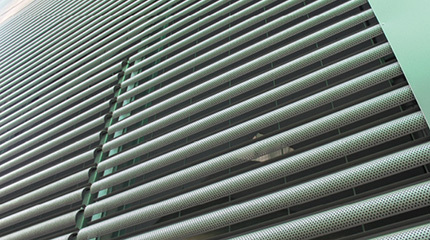 Teti wall cladding system consists of modular monolithic panels, mesh size 116 x 200 mm, special section horizontal profiles (center distance 116 mm), 4 mm diameter round bar vertical connections (center distance 200 mm). Finish: polyester powder coating on hot-dipped galvanized material according to UNI EN ISO 1461, or on Sendzimir steel. Front fixing system with self-tapping screws. The use of a fixing element per profile is recommended. Panel sizes 5500 x 1972 mm.